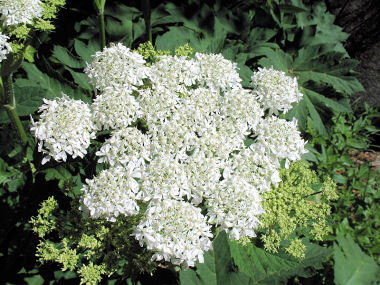 Cow Parsnip is a member of the Carrot Family. 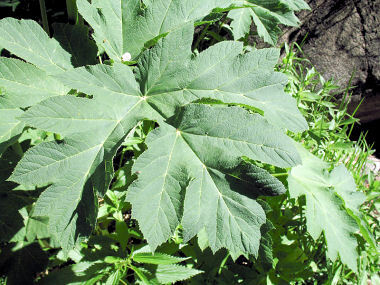 It grows to 10 feet in height and has large, green leaves divided into 3 lobes with toothed edges to which grow to 16 inches in length. It grows in moist, shady places to 9000 feet in elevation. Cow Parsnip is the largest native carrot species in North America. Cow Parsnip blooms between February - September and produces a flower umbel to 1 foot in width which is comprised of many small, white flower with 5 petals each to 0.25 inches long.